Speech Pathologist Danielle Kennedy (pictured below) from Far West LHD has graduated the Clinical Excellence Commission’s (CEC) Executive Clinical Leadership Program on Thursday, 9 March 2018. 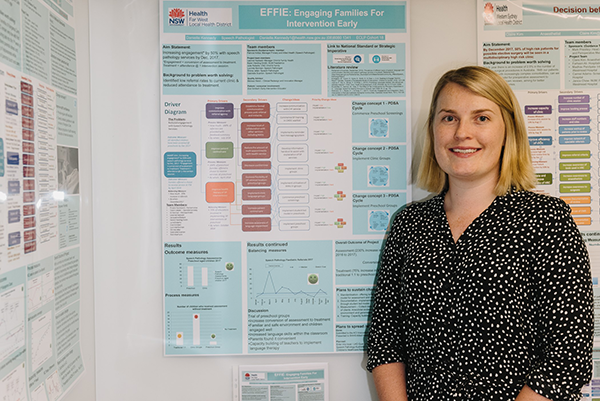 Danielle’s project for the program was titled EFFIE: Engaging Families For Intervention Early. Each of the graduates presented a clinical improvement project as part of their final work. Danielle explained her project: “My project was focusing improving access to Speech Pathology services to provide early intervention for children with speech and language delays. If speech and language disorders are not treated they can lead to poor educational outcomes, reduced employment prospects and ongoing mental health issues. CEC Director Governance & Assurance, Dr Paul Curtis, said the executive Clinical Leadership Program graduates are among the clinical leaders who will guide the health system over the next decade. Participants come to the foundation and executive levels of the program with the support of their local executive and a desire to achieve improvements in how they, and their colleagues, care for patients. So far, more than 3000 NSW participants have enrolled in the programs. The Clinical Leadership Programs are part of the Clinical Excellence Commission’s Quality Improvement Academy, which has been established to design and deliver a range of education programs for staff working in patient safety, improvement and clinical governance.